It’s been an anxious week. When would CheekyTransport advise that “Wotsitsname” was ready for pickup? Yes, the new Brompton S6E for Mrs Aussie was eagerly awaited & all we’d had was an email after the order to say the new bike was on the way… Hell, how do people cope with the B-Spoke order time-frame? 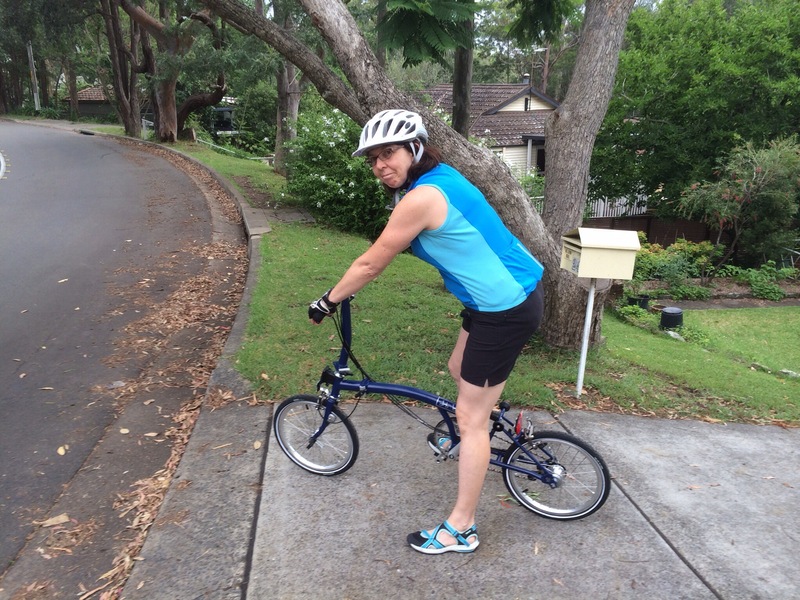 Mrs Aussie does seem rather pleased with her new flat-bar 6-speed bike & I’m certainly envious (although there’s probably no sympathy for me, as Ralph (my own flat-bar Alfine 11-speed Brompton) is a buzz). Funny how things change. It’s always hard to keep up but recently I was checking out the Brompton Australia Distributor’s website (http://www.kobie.com.au/brompton-bikes.html) & was rather shocked to see how prices have changed. I’m not talking about all the Brompton parts on the website (those parts & accessories that would previously have required an online purchase from overseas – or very slow supply via a dealer order?) but indeed the prices for the stock Bromptons available on the website! 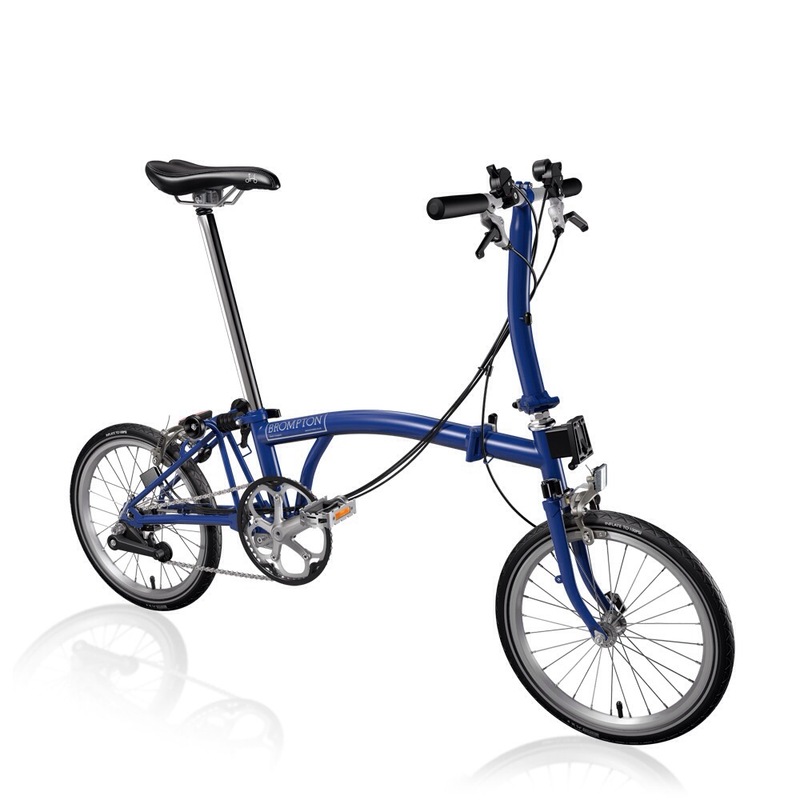 It’s been quite some time since I first noticed Bromptons included on Kobie’s site & what was immediately disappointing was that prices seemed so much higher than what the Brompton Bike Builder system suggested should be the A$ MSRP (Manufacturer’s Suggested Retail Price). When the local pricing is hard to define for Bromptons that need to be ordered as B-Spoke supplies & with inordinate/vague lead-times, perhaps the Kobie site prices were true local prices? Still, no need to involve myself as Ralph & Robinson were sitting happily at home & our Brompton family seemed settled? 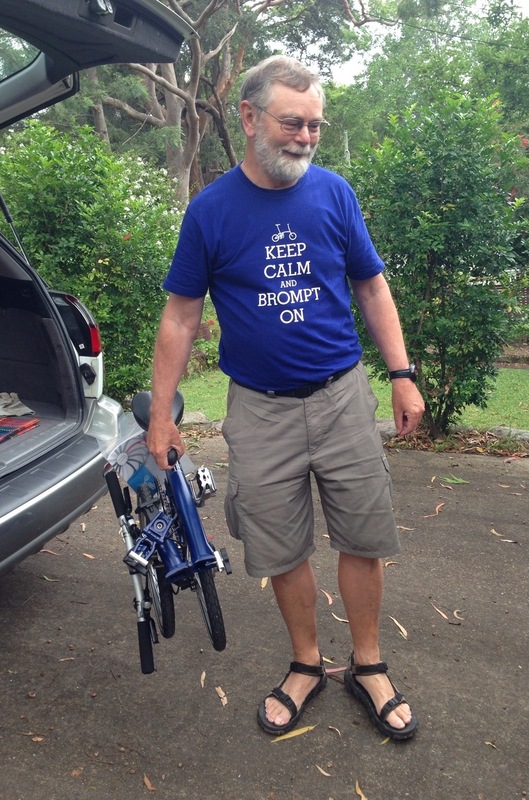 Of course, another o/s trip is always an appealing way of picking up a new Brompton (at a competitive price?) isn’t it? However, my recent Kobie website shock was in fact, a very pleasant surprise. First, the number & range of Bromptons listed had grown. Next, the later entries were shown with prices the same as Brompton’s A$ MSRP figures! Finally, I was amazed to see “Special prices” listed for these new entries, with discounts that seemed about 10% Surely I was dreaming? A bit of research needed here, I decided. With the tantalising new prices & some stock bikes that were very appealing, it wasn’t long before an order was placed for the S6E Brompton in Cobalt Blue for Mrs Aussie. Woohoo! Wanting to start 2014 with a little mid-week break away from the heat of Sydney, we thought that taking the Tardis (our VW T5 Campervan) to the coast for a few days was going to push us into the school holiday crowds that we would normally avoid. So instead, we headed for the Blue Mountains to take advantage of that possible 5-10° cooler environment? Also, a chance to check out how the recovery from the recent bush fires was going? 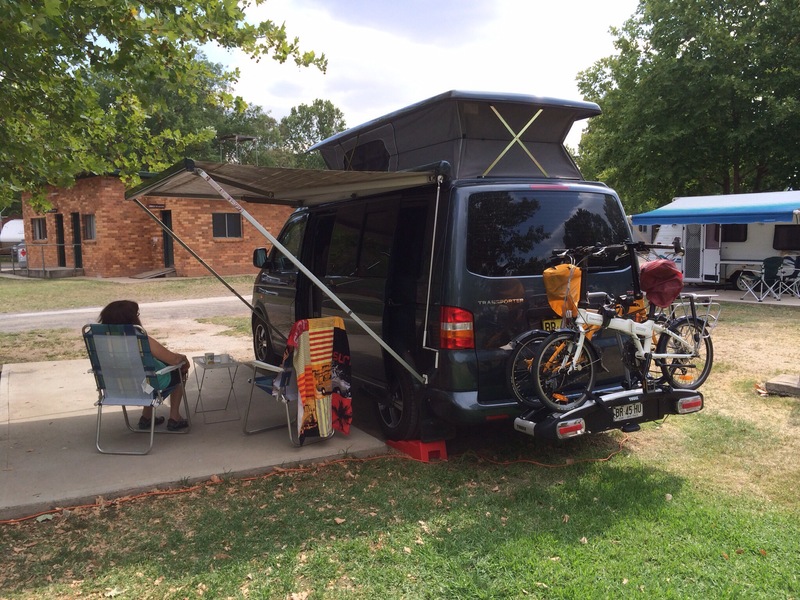 The likelihood of getting a site at BM campgrounds was slim so we headed further west to Lithgow for a couple of days (much quieter & cooler). Off for a ride the next day, we took in Blast Furnace Park, a memorial to the Steel-making days in Lithgow. 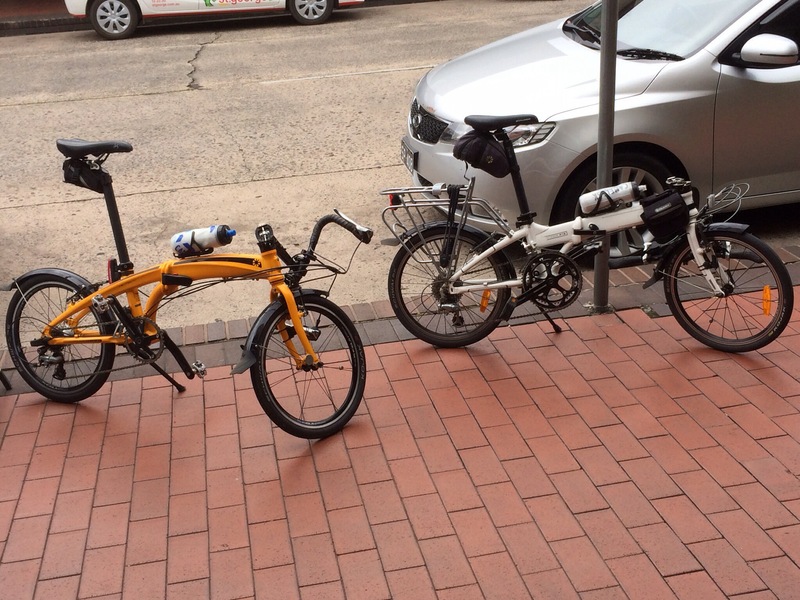 Stopping for lunch in town & parked at a cafe & did our mini-security act of folding the handle bars. A “resident laptop user” in the cafe noted our bikes as folders but thought they were recumbents; reminding me of a lady on a train that thought my folded Brompton was a folding wheelchair? 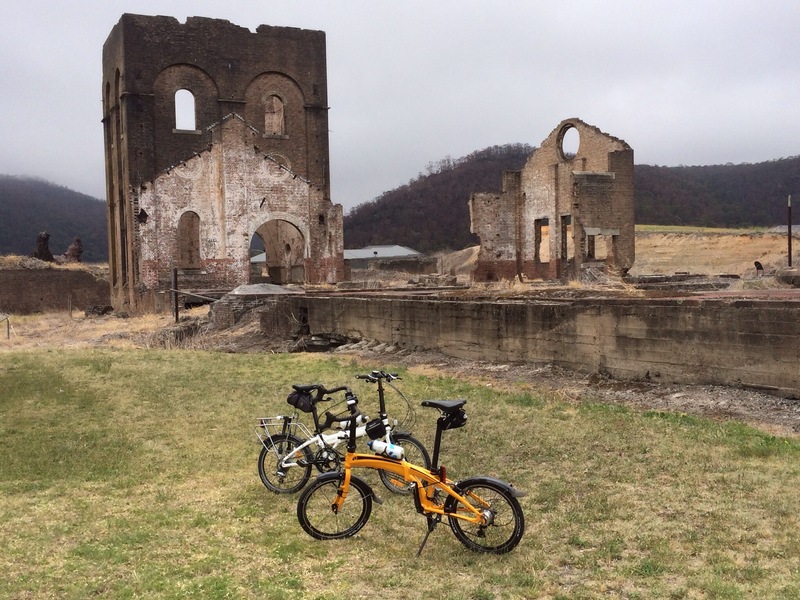 Our stay in Lithgow took in more of the Coal & Steel historic sights & then it was time to move on – even for no other reason than escaping the overnight single-figure-degree temperatures? (A lot cooler than we were expecting.) 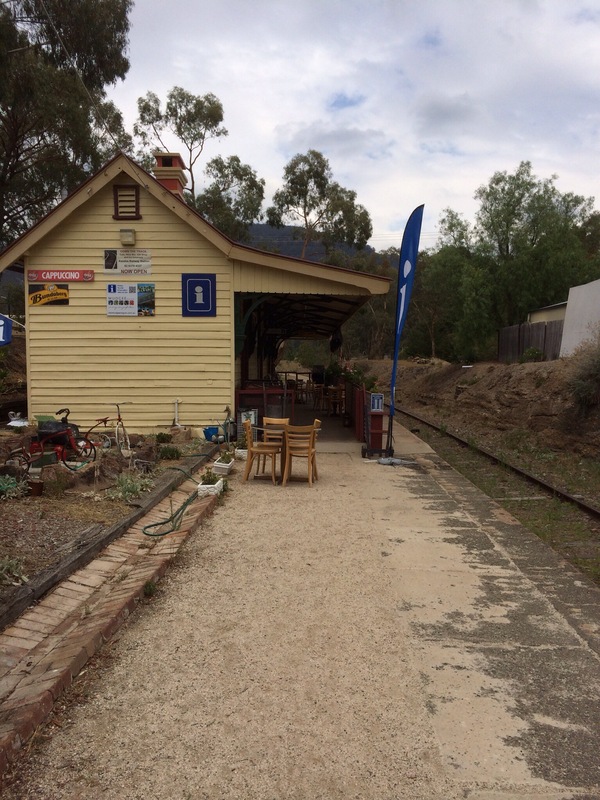 Heading for Mudgee we detoured via the Kandos/Rylstone road & came across a great little cafe occupying the old railway station at Kandos. Settling in at Mudgee, we reflected on the current temperatures: Sydney 30+°, Lithgow 12°, Mudgee 24° – a good decision! 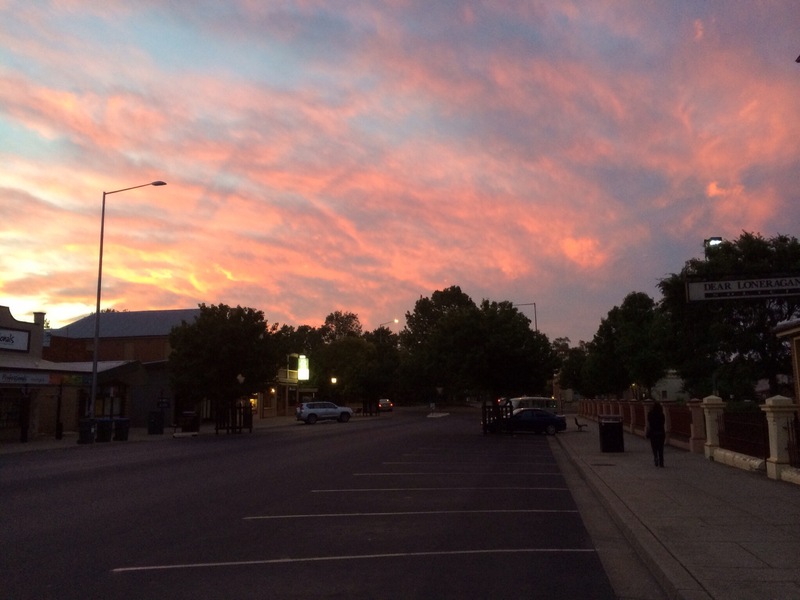 Strolling the short distance into town for dinner, the old saying came to mind, “Red sky at night, a farmer’s delight”? 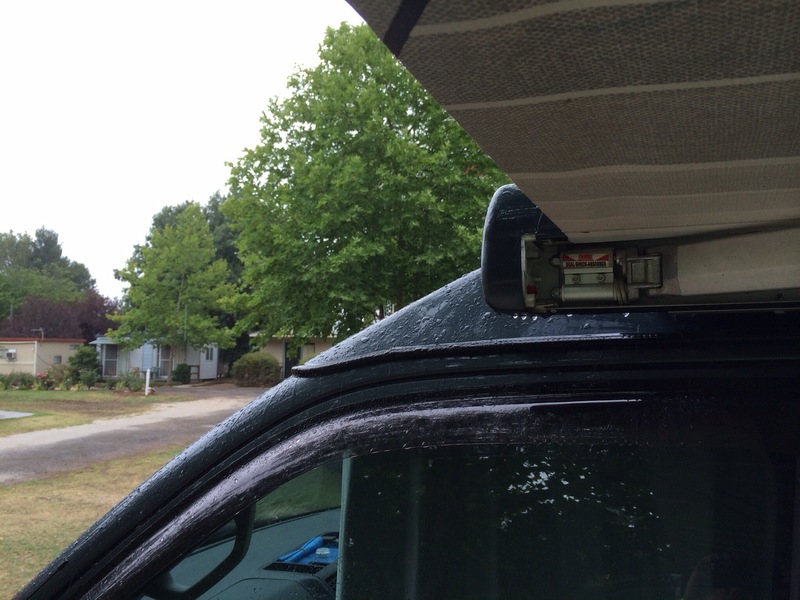 Awoke the next morning to see some funny little bubbles all over the van & awning? I suppose farmers may have been delighted to see some rain but it wasn’t what I was expecting. Oh well, good excuse to settle down with some wine-tasting & lunch at a winery?